Start your holiday in the Cook Islands with an orientated cultural tour of scenic Rarotonga in one of our modern air-conditioned coaches. Explore the history and culture of the Cook Island people in the company of our qualified, friendly tour guides. Follow the roads and paths used by our ancestors dating back to 1100AD; visit a sacred marae (ancient gathering place for royalty) and explore historical sites once inhabited by our people. Learn where the best snorkelling spots are located in Rarotonga, see why the coconut tree is known as the Tree of Life and watch a coconut husking demonstration. You’ll even get to taste the flavoursome juices and flesh of the coconut. Also enjoy the fragrances of various oils and perfumes, as well as tasting locally manufactured exotic liqueurs. Private Island Discovery Tours are also available. Please contact us for more information. 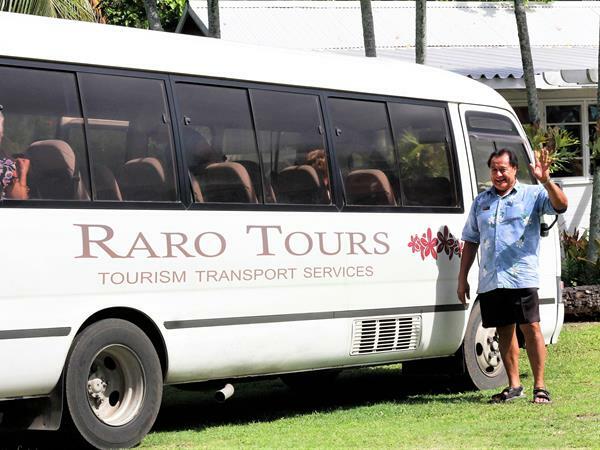 All tours include pick up and drop off, from and to your Rarotonga accommodation. Cancellation requests received outside of 24 hours prior to your transfer, or tour, will be refunded 100%. No refund will be made for any cancellations received within 24 hours of the transfer, or tour.